Through the years, the Android OS never failed to amaze its users with their improvements in each update. The ninth version of the Android operating system was already announced by Google. This OS has a lot of changes on its features such as the dashboard, adaptive brightness, notifications, new gestures, improved battery life and so on and so forth. However, there are some functions that we need yet it is not included in the update like screen recording feature. Luckily, we have here three screen recorders that you can try to record Android P screen. The first one is Apowersoft Screen Recorder. This free screen recorder is completely compatible with the Android version of 5.0 and up. It allows you to record games, video calls, and other activities on your phone. Besides, you can also use your phone’s camera when recording. Furthermore, you can trigger the overlay icon to make it float on the screen of your device so you can start and end a recording while using other the apps. Also, you can easily take screenshots with it. Here is the full guide on how to record Android P screen with this tool. 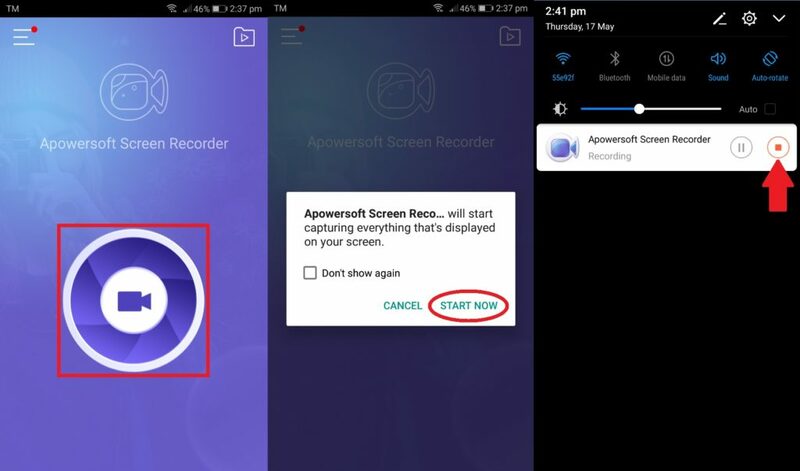 Download the Apowersoft Screen Recorder on your Android P.
Open the app, tap the video camera icon in the middle of the interface and then hit the “Start Now” button on the pop-up window to start recording your Android P screen. When the recording is done, tap the overlay icon then the “Stop” icon. Or you may swipe down the screen of your phone, and then tap the “Stop” button from the notification bar to end it. Finally, the recorded video will be saved on your device. 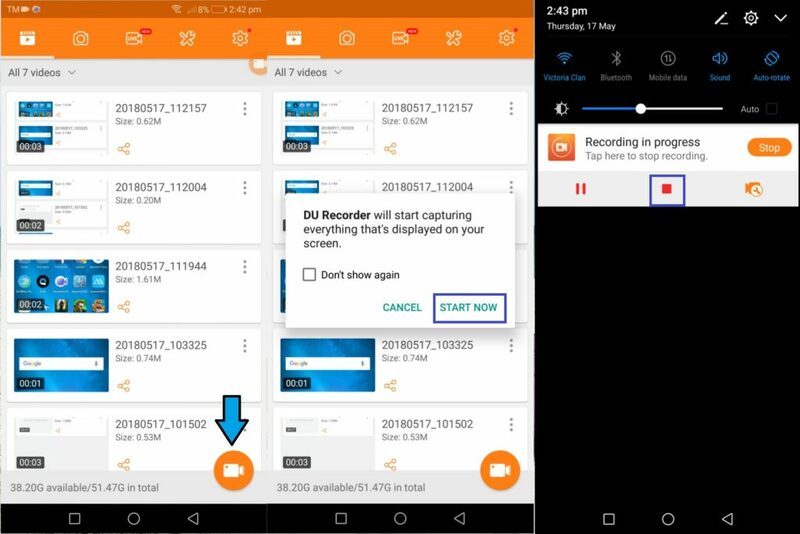 Another way to do screen recording on Android 9.0 is to use DU Recorder. This is a free screen recorder which has smooth features, and it gives you a convenient way to record your phone’s screen. It can be used while you are making video calls, playing games, live shows and many more. Moreover, it can also take a screenshot of your phone screen and edit it right away. Follow these steps to utilize this application. Install the DU Recorder on your Android device. Next, open the tool. Tap the video camera like icon to start recording. When a windows pop up, hit the “Start Now” button to begin the recording. Then it will start to record the screen of your Android phone. Once you are done, simply swipe down the status bar then tap the “Stop” button in the middle to stop the recording. You can go to folder to check the recorded file directly. Another screen recorder for your Android 8.0 is the Mobizen Screen Recorder. This screen recorder has a simple interface and is easy to use. It not only allows you to record the screen of your phone but also take a screenshot and edit it. Moreover, this application requires Android version 4.0 or above. Below is a simple guide on how this tool works. 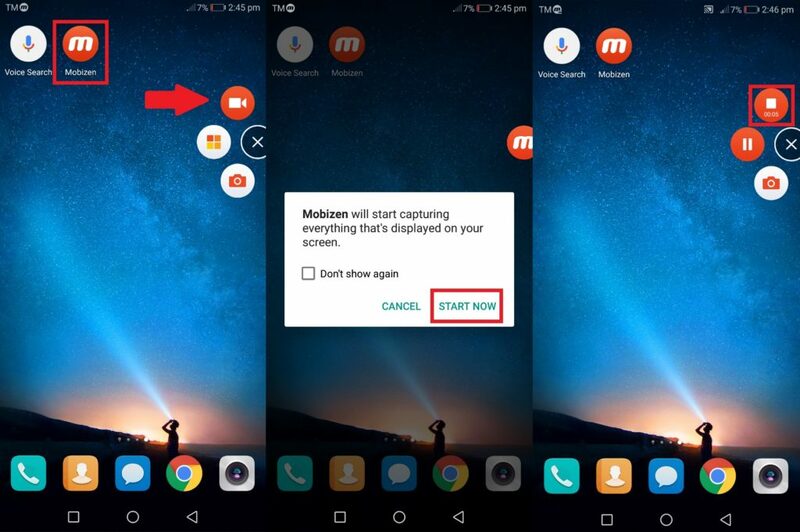 Install Mobizen Screen Recorder on your phone. Open the tool, and the overlay of the tool will pop up automatically. Tap the overlay icon, then hit the screen recording button to start. Once you finish the recording, just tap the overlay icon and then the “Stop” button to end the recording. To sum up, all these screen recording tools are perfect for use when you are about to record your Android P’s screen. 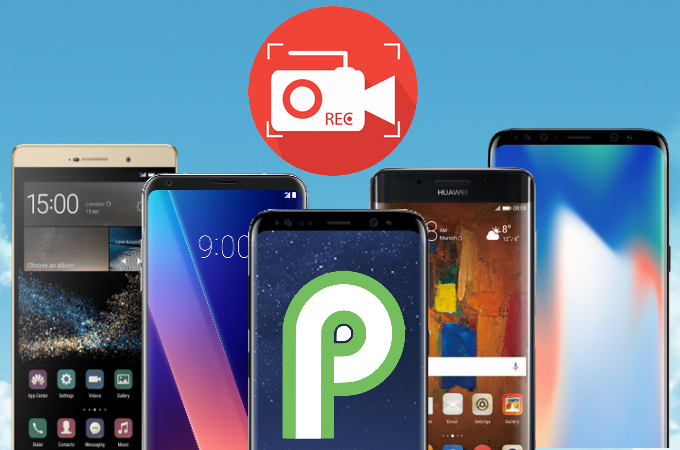 You can try these free Android P screen recorders and choose which suite your preference. Among them, Apowersoft Screen Recorder has a simple interface yet provides an advanced function for better screen recording and screen capture quality, which will definitely meet your needs.